In this interview Piero Quintiliani discuss his experience and its views on design in the electromedical sectors. Quintiliani is still in the early stages of his industrial design career but he has already done a great deal, concentrating mainly on the production of electromedical equipment, especially for neonatal medicine. In keeping with the standard professional training approach for young designers, right from the start Quintiliani has been determined to gain all-round knowledge of techniques, materials and project development. He has made good use of this know-how in his work designing cots for newborns, lights for phototherapy, bilirubin measurement devices for Ginevri (Albano-Cecchina), and cosmetic medicine equipment for Triworks (Guidonia). Electromedical goods: how have the aesthetic and technical characteristics of the products and the forms of communication evolved in these areas related to health, wellbeing, therapy and beauty? 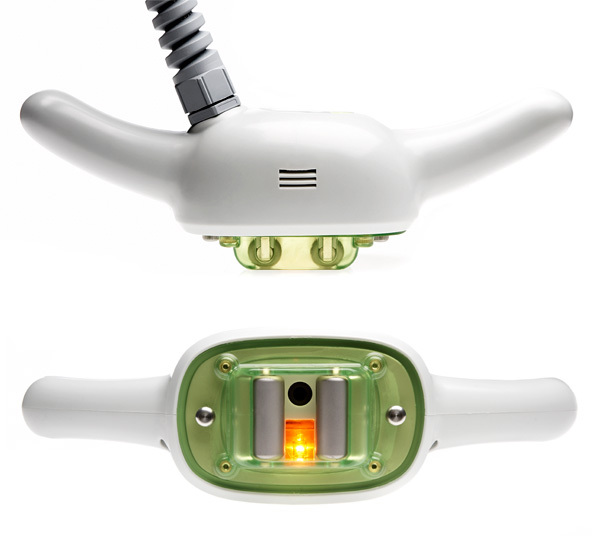 The majority of my design work so far has been in the field of electromedical devices. I have worked with various companies on instruments for care and therapy, and recently also on devices for cosmetic medicine, well being and beauty. The two sectors are closely related and continually evolving. Like in other fields, first and foremost comes experimentation and the constant adoption of new materials. 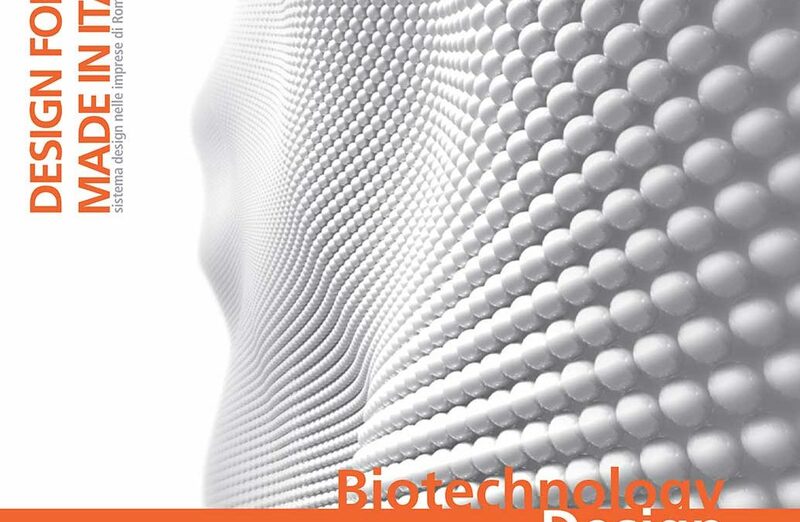 For example, I believe that Mater Bi, a 100%biodegradable material made with maize starch, will be used in the biomedical field for potentially innovative purposes. Above all, the collective awareness is continually evolving. There is a world of constantly changing shapes,forms and colors that has to continually express new contexts and technologies, to adapt to the changes in the way people live, interact and communicate. 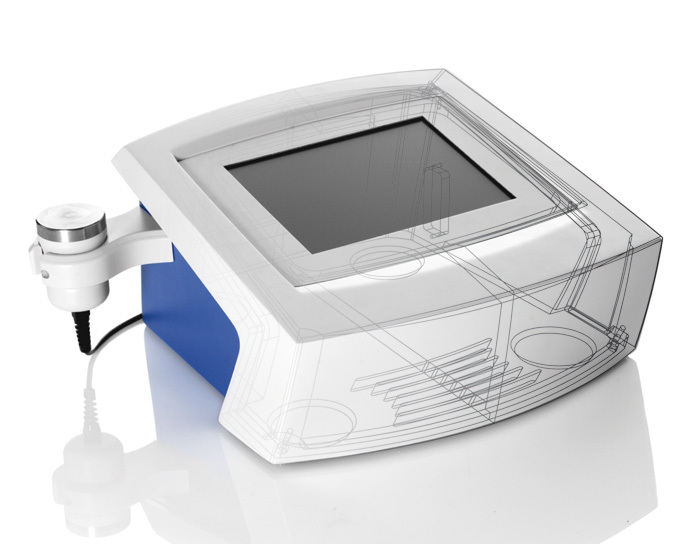 Innovation in the fi eld of electromedical devices involves a new way of conceiving equipment, making it increasingly practical,communicative and in tune with those who utilize it, both the operators and the end users. At the same time, these objects for highly specific use that seem far removed from daily life can integrate with everyday aspects and habits. This is illustrated by ‘nido’, a cot I produced forthe Albano-based newborn care company Ginevri. The standard cots normally found in hospitals and clinics are used for keeping the infants near to their mothers and moving them around. Until now a horribly make shift system was used to deal with the problem of covering the children during transport: an upside-down cot would be placed on top, like a saucepan lid. 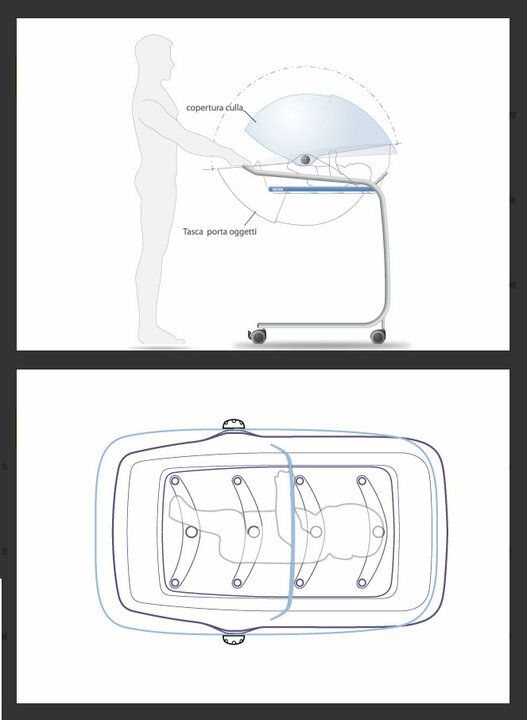 In addition to improving the materials and elaborating an expressive system to convey safety and reliability, the project resolved the issue of the cover by creating a rotating device like those on push chairs, which is hinged to the cot and can be moved with just one hand. This brought about a significant change in function and today the performance of the object is completely different. Sometimes, for other projects regarding cosmetic medicine devices, I try to use shapes to make room for surfaces that can perhaps be used for setting down smartphones or the other accessories that are increasingly becoming part of our daily lives. In this way the object opens up to other support functions and fits in with our everyday needs. How should the characteristics of the pharmaceutical or the device be perceived or perceivable by the users? Design is a means of conveying information. The correct data are expressed by good projects. By working with care and dedication – with love, I would say – it is possible to pass on information through unconscious messages that are not really linguistic. To go back to ‘nido’, the cover which can be moved with a single hand communicates the idea of reliability and overcoming a problem in a positive manner. What kind of relationship have you had with technology in your work and how have the restraints of technology and materials affected your design? I believe that restraints can become incentives for a good design project, for finding more and more intelligent solutions and for taking things to the next level. They pose problems, but solving them gives great satisfaction and is enjoyable. Old-fashioned technical design almost saw the limitations imposed by technology and materials as sacrosanct and nobody ever dared to attempt to over come them. 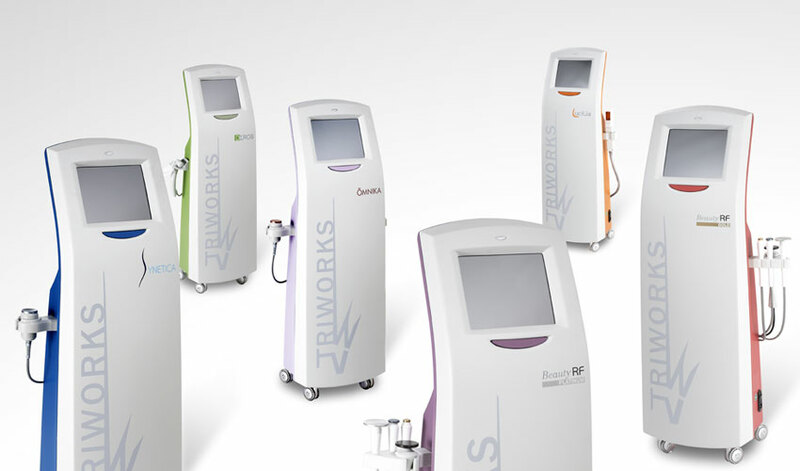 The arrival of designers in companies has led to efforts to do just this, to see what the alternatives are and try to make improvements.I recently worked very closely with Triworks, a young company in the business of electromedical devices and equipment for cosmetic medicine. They use various forms of technology for a range of methods: radio frequency, intense pulsed light, cavitation and more besides. They have extremely sophisticated machines which offer excellent performance in practical terms but they were designed with no consideration of aesthetics. They looked like items of furniture, boxes of bent sheet metal, unfinished bodywork, giving a negative impact in contrast with the advanced technology; they conveyed the opposite of safety and reliability. It was not just a question of the image, but also of the functionality and expression, like putting a latest generation laptop in a 1990s PC.I designed a container for various types of tabletop and freestanding equipment using rigid polyurethane moulds.This allowed rationalized production and gave significant savings. It is made of two monocoques; the color of the rear section varies according to the type of equipment. If you compare the old machines with the new models, it’s like placing prehistory alongside the modern age. What kind of relationships have you had with clients in your professional career? So far I have had positive experiences. If the client calls you and places their confidence in you, there is greater involvement and more responsibility; a very productive relationship is established. With Triworks in particular there is a great deal of understanding, perhaps partly because we are the same age. What advice would you give to a young person who wanted to work in your field? I would advise them to be as attentive, informed and sensitive as possible. You cannot afford to be caught napping. They need to shake off the sluggishness and the indifference that I see in all fields. You need to be well-informed and inquisitive. To borrow an example that others have made, designers need to be a bit like reporters, always keeping track of what’s going on. Modernity cannot be expressed if you are standing still; you need a great deal of dynamism in this job. I would advise people who live in Italy to gain some experience abroad, perhaps because it’s something I didn’t do myself as I was lucky enough to immediately find a place in the world of work. In my opinion, you should avoid isolating yourself in one field. I recently designed a roof rack for a city car; I find working in lots of other sectors stimulating. Nonetheless, I would recommend working in the electro medical field as it can help you to develop precisely because of the difficulties and restraints that we mentioned earlier. On the other hand, I would avoid the areas that are now saturated, like gift items and household goods. In general, I would advise people to be bold and try presenting themselves and offering their services to the new businesses which, partly thanks to the younger generations, have great potential,especially in the Lazio region.